After over a year of sporadic menses and months of hot flashes, I have now gone more than 5 moons without menstrating at all. Nearing my 48th year, I am well into menopause at this point I do believe. With it, I am entering into the Crone-Dark Moon phase of my biologic lifecycle. What indeed shall be the Essence of Wisdom to come? I'm giddy with anticipation! Over a 53-day period of time, beginning with the Harvest Full Moon (September 15) of Belz-Elul and culminating on astrological Samhain (November 6), I will initiate myself into Cronehood. 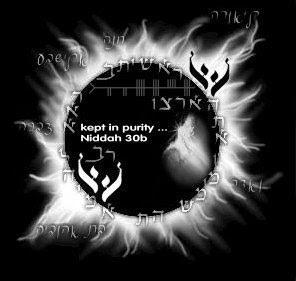 Fifty-three is the gematria of Garden (גן), The Jubilee (היובל) and "from the Malchut of Echad" (מאחד). I haven't yet designed the initiatory rituals I will employ, as the brilliant idea to do this just came to me. One thing I know I'm going to do is to choose a new magical Crone Name for myself, adding it to the names I am already known by. Over the next two weeks, I'll be planning and preparing for this big event in my life. 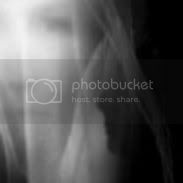 More on the banshee - a faery woman of peace who never forgets her mortal family wherever in the worlds we may settle. In follow-up to my entry of earlier today, linking both Jewish and Celtic traditions to Torah through the time of the Sidhe Moon of Shabbat Belz, I had a dream this morning/last night which again links the Sidhe Moon to Torah through another element of time. This shabbat is not only Shabbat Belz (first shabbat of the month of Belz) according to my Witch's calendar, it is Shabbat Machar Chodesh according to the Hebrew calendar (machar chodesh means literally 'tomorrow is the new month' - according to Hebrew timekeeping). On this special shabbat, when the Torah portion Re'eh (meaning 'see') coincides with a special shabbat (which this one is), in Jewish tradition, we also read a portion of Torah (called a Haftarah) from the prophets, specifically, the portion I Samuel 20:18-20:42. The Haftarah portion from Samuel discusses a 'seat' - David's seat. In this portion, Jonathan tells David - "Tomorrow will be the new moon; and you will be missed when your seat remains vacant." There was a large ancient black magic chair in the place. Many from two ancient tribes stood around it, as members among each of them contemplated the possibility of sitting in the magic chair. But it was very dangerous to do so. The chair's magic was greatly coveted. To sit successfully in the chair bestowed much power upon anyone who could sit in it without being destroyed. For certainly, the power the chair liberated within and through the sitter would destroy the unworthy. My vision flashed to see how this destruction had happened to a promising young man once before who alone dared to sit in the magic chair. The destruction of the unworthy who dared to sit in it came about because the chair multiplied exponentially that which was already contained like a seed within the chairsitter. So actually, the chair did not itself bestow power, it actually functioned as a catalyst through which power was released to destroy (via unstoppable exponential expansion) the unworthy sitter or to enable the worthy sitter to do great magic. The outcome was solely determined by the worthiness of the sitter. Nearly everyone who had ever sat in the chair throughout all time had been destroyed. Consequently, while the magic of the chair was desired, the fear of sitting in it kept potential sitters from sitting. The risk was great and the likelihood of success small. I looked at the awesome ancient black chair and felt no fear of unstoppable expansion. There was no fear in me because there was no expansion that was unstoppable in my mind. I felt able to stop the putatively unstoppable. Then there was a man with dark red hair and a dark red beard (characteristic of both biblical David and of Irishmen in general) who sat in the chair. Somehow then, I too was sitting in the chair, in his lap. The great magic power then released through us. The dream stopped, and I woke up. Safe and sound. I lit a candle in honor of my ancestors, dressed with the Honor Ancestors Incense made this Shabbat of the Sidhe Moon, during the planetary hour of Pluto (corresponding to Malchut). I came home yesterday from work to find that I had finally received the new book in the mail that I had ordered a few weeks ago - The Sidhe, Wisdom From The Celtic Otherworld. I had been waiting for the book on aes sídhe (pronounced 'ess shee') to arrive for an unusually extended period of time and had been considering contacting the bookseller soon to inquire as to the possibility that my book order or the shipment had been lost. That would not be necessary now, for The Sidhe arrived just in time for shabbat of the Sidhe Moon. A Sidhe Moon, also called the Other Moon, is the uncommon phenomenon of two Black Moons occurring in one solar month. The second Black Moon in such a month is called the Sidhe or Fairy Moon. This rare lunar event occurs today, in the year of 2008/5768, on shabbat (weekly Jewish sabbath) of the Torah portion Re'eh (meaning 'see'), on the first day of the Witch's month of Belz (Days of Fire), and on the penultimate day of the Hebrew month of Av (Days of the Young Shoot/bud). The first letter of the Hebrew alphabet is aleph (א). The penultimate letter of the Hebrew alphabet is shin (ש). Together, the letters aleph-shin spell the Hebrew word esh (אש) meaning 'fire'. The period of time corresponding to the Witch's month of Belz is, as written above, called 'Days of Fire'. White Fire corresponds to the two Hebrew letters of the word esh, meaning 'fire', symbolizing the mutable Light of Awareness. Black Fire corresponds to the dark Sidhe Moon of the month of Belz, the Days of Fire, and to the immutable note of a Dark Essence Ancient of Days brought forth through the Old Forest Craft of this shamanic Jewitch. Interestingly, the Sidhe teach of the unique note each creature and species contribute to the exquisite song of All Being within the pages of the book I received yesterday afternoon. The Sidhe Moon is an element from the Teaching of Green Witchcraft. Interwoven with this teaching of Green Witchcraft is a teaching of Torah. Torah is also a Teaching Tradition (like Green Witchcraft) which describes the Blueprint of Creation and is itself described in the Midrash (Jewish mythology) as “black fire atop white fire” (Sifrei, on Deuteronomy 33:3). Integrating all these ideas simply and wholly, we can see that not only is there Wisdom among the Sidhe, we can see that there is Torah among the Sidhe as well. Equally important, just as tzaddikim may have Da'at Torah (integral knowledge of mystical-magical Law-Teaching), so too may witches have Da'at Torah. And so begins my relationship this shabbat with the Sidhe, with black fire atop white fire. Christian churches in England have lost at least 50,000 women from their congregations every year since 1989, says a sociologist. Dr Aune added: 'In short, women are abandoning the church. Because of its focus on female empowerment, young women are attracted by Wicca, popularised by the TV series Buffy the Vampire Slayer. 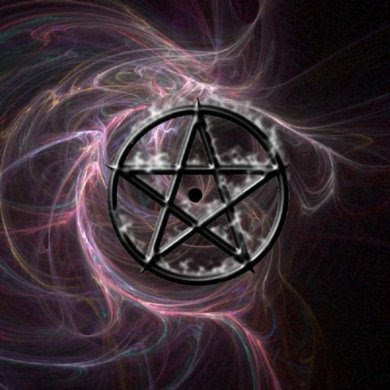 Jewitchery is a growing phenomenon as well as is Wicca and other flavors of witchcraft. Clearly, patriarchies are on their way out as far as Western women are concerned. We aren't going back to Mitzrayim. This coming shabbat the new moon of the witches' month Belz is in Virgo. Corresponding to Virgo are the Hebrew letter yud (the highest level of the soul according to kabbalah, yechidah), the Ogham letter Coll (wisdom, mercury), and the Ogham letter muin (communication). In a faraway kingdom, there lives a King with his twelve children: eleven princes and one princess. One day, he decides to remarry. He marries a wicked Queen who is actually a witch. 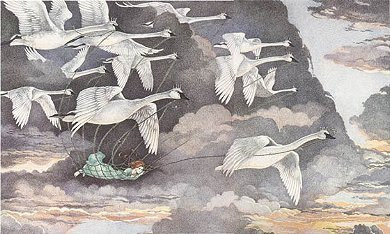 Out of spite, the queen turns her eleven stepsons into swans and forces them to fly away. They carry their fifteen year old sister Elisa to safety in a foreign land where she is out of harms way of her stepmother. There, Elisa labors mutely day and night knitting magic shirts from nettles to help her brothers regain their human shapes, as this is the only way to break the spell their stepmother forced them under. The king of another faraway land happens to come across the mute Elisa and falls in love with her. He grants her a room in the castle where she continues her knitting and eventually crowns her as his Queen and wife. One night Elisa runs out of nettles and is forced to collect more in a graveyard. She is spotted by the evil Archbishop who is looking for an excuse to accuse her of witchcraft. He convinces the King that Elisa is a witch and sentences her to death by burning at the stake. At the place of execution, the swans descend and rescue Elisa. The magic shirts are donned and the brothers return to their human forms. Elisa regains her voice and explains the reason for her mysterious work to the king. Elisa's courage prevails and she is forever reunited with her brothers. MOAB, Utah — A twin-engine plane crashed and burned near an airport not far from Arches National Park in southeastern Utah, killing all 10 people on board, an official said Saturday. The plane was fully engulfed in flames when emergency responders arrived late Friday at the site about 2 miles from the Canyonlands Field airport, and there were no survivors, Grand County Sheriff James Nyland said. The airplane was a King Air A-100, said Mike Fergus, a spokesman for the Federal Aviation Administration in Seattle. He said that "to the best of our knowledge" no flight plan had been filed for the trip, but he said that isn't unusual. Nyland said the victims were the director of Red Canyon Aesthetics & Medical Spa, a dermatology clinic headquartered in Cedar City, his clinic staff and the pilot. He identified them as pilot David White; Dr. Lansing Ellsworth; David Goddard; Mandy Johnson; Marcie Tillery, 29; Valerie Imlay, 52; Keith Shumway, 29; Dallon Ellsworth, 24; Camie Vigil, 25; and Cecilee Goddard, 25. Lansing Ellsworth had recently started a monthly skin clinic in Moab, Nyland said. Taken together, the successful mystical experience/prayer/spell is not only able to run to Unity, it is able to return to bring forth and make manifest that Unity from within the world of Plurality, bringing prophecy and wisdom peacefully together into a single stream of enlightenment. In follow-up to my earlier entry (The Inverted Seal) describing my dream last night, my friend Muninn's Kiss notes in Two Wells, One Name some relevant similarities between Miriam (Jewish prophetess and guardian of Miriam's Well) and Mimir (Norse god and guardian of Mimir's Well). On Miriam's Well from The Inner Dimension - "The Well of Miriam was for drinking and also for washing clothing. Water serves two purposes. One is for drinking, when it becomes part of the person's life force. The second purpose is for cleansing the body and clothing. The skin itself is also clothing of the inner dimensions of the body. The fact that water is necessary for washing, is the way to meditate on the Chotam Hamithapech. The water of the Well of Miriam, in addition to being used for drinking, comes to wash the clothing of the Jewish People." On Mimir's Well from Wikipedia - "Mímir's Well (Old Norse Mímisbrunnr) is one of three wells at the roots of the world tree Yggdrasil in Norse mythology. The well is named after Mímir, the god charged with guarding it and is fed by a fountain inside it called the fountain of Mímir, which granted wisdom and the power to see the future. Mímir is known as the wisest of the gods; his name translates to "memory." As told in Ynglinga saga, in his youth, Odin desired the wisdom of Mímir's Well, and visited Mímir. They struck a bargain – Odin sacrificed one of his eyes in exchange for the privilege of drinking from the well. This wisdom helped him lead the Æsir, but showed him a vision of the destruction of the Æsir at Ragnarök. This knowledge of the future weighed heavily on Odin, who was said never to have smiled again." Note the three-fold cord of connection to my dream - the inverted seal (from Miriam's Well), the eye/pupil (from Mimir's Well) and the concept/command of memory/remembering (Mimir's Name). Interestingly, in Kabbalah it is taught that the two streams of prophecy (represented mythologically by Miriam's Well) and wisdom (represented mythologically by Mimir's Well) are destined to combine into a single stream of enlightenment. The two streams come together peacefully without Miriam's bitterness or Odin's sacrifice in the three-fold cord of connection of my dream. The only thing I remember about the dream is the waking vision I had of a man's hand coming forward as if to show me the ring on his finger which 'identified' him to me. It was almost as if I were being shown the ring for the specific purpose of determining if I could see and remember it upon waking. As the ringed hand came forward, it seemed to beckon me to 'remember', and to 'recognize' it. It had the feel of a 'king's seal'. The ring was a very wide band (perhaps even over 1/2 inch wide) of silver with a rough design on it. Inset into the middle of the band was a round white stone about the size of the pupil of an eye. It caught my eye. The color of the stone (white) which resembled a pupil is the inverted color of a pupil (black). The ring had the feel of a seal. The dream symbolism I recognize pertains to the 'inverted seal' of kabbalah - the chotam hamithapech, where the very highest (soul) level of yechida becomes physically manifest at the level of malchut. The three of cups, a card of celebration and abundance, is the card I pulled out from my tarot deck (planetary hour Venus, waxing gibbous moon 96% full) to describe where my life is headed. Now, while I need some good news after the event of my last post, I'm unconvinced. In follow-up to my earlier entry discussing my shabbat dream (Endless Legion From The Elementary Sea), connected to the dream's reality is the fact that last night I went to sleep after reading the chapter Creation, What Every Pagan Should Know About Evolution from Starhawk's book The Earth Path, Grounding Your Spirit In The Rhythms Of Nature. In this chapter, Starhawk discusses the concept of Gaian evolution. After reading the chapter last night, as I lay in bed contemplating my own Gaian connections, the reality of those connections emerged. Reaching far back into premanifest consciousness, evolving up through the elements into single and multicellular organisms and into beyond the human animal, ever-existent within the ever-evolving yet timelessly unchanging tapestry of Nature, my Eternal 'Ancestral' Matrix made its Eternal Presence known. It is very good and beautiful. Behind the scenes some who didn't like me were trying to create animosity against me in secret meetings within a community located by the sea, where I too was located. It was a small movement doomed to failure. More and greater were those in need of me. In the dream, another evening meeting place over and against the instigators' meeting was occurring in the gymnasium of the elementary school I had attended as a child (the building is no longer a school). I was sitting on the stairs (in the middle) right outside the gymnasium, which led up to the fourth/fifth and sixth grade classrooms which I had once occupied in the 4th, 5th and 6th grades. * Here in the elementary school of my youth, support for me was mustering together. The wizard who now owned the old elementary school was calling up forces more powerful than those against me, and way beyond the small domain of my enemies' forces. Sitting on the stairs of old Lynch School, I felt trusting, innocent and childlike. I felt so protected, sitting on those stairs, so at home, so magically rooted into the heart of the earth. Then, I saw the forces coming together in the darkness of night outside the building. An endless legion of creatures ascended from the sea and came ashore, onto the land of living creatures, and mixed into the community. Elemental forces swirled invisibly with the air surrounding the building. A warm fiery glow softly lit the consecrated space inside the schoolbuilding. I felt completely safe, completely protected. My spirit rested with perfect peace. *Classrooms for Grades 1-3 and half of 4th Grade were located on the ground floor. Classrooms for the other half of 4th Grade and Grades 5-6 were located on the second floor. I spent 4th Grade in the second floor classroom. In this dream, I was sitting in the middle of the stairs 'between' and 'joining' the first and second floors. I attended this school for all 6 years of my elementary school education. Related to the metaphysical concept of soul-friends as discussed in previous entries (Anam Chara - Reyah - Soul Friend and The Blessing Of Rejection) is the concept of natural Archetypes and their importance to soul craft, magic and mysticism. We are not discussing an archetype in the modern psychological sense; an Archetype is a Matrix or key Image which gives shape and direction to energies arising out of the Primal source of all being. Modern astronomy has shown us the physical expressions of such Matrices in the vast spiral shapes of distant galaxies, while physics reveals patterns upon the most fundamental atomic levels. These material reflections of Archetypal Matrices (long understood by the ancients in the pure shapes of the Platonic solids) offer us exterior clues to our interior consciousness; and in non-scientific cultures an equally perceptive model of both macroscopic and microscopic Nature was found through Inward cognition. We can understand from this description that Archetypal Matrices also give shape and direction to the structures of consciousness with which we are formed, to construct our inner Nature. Religions and mystery traditions which project alien Archetypes onto the psyche (to the exclusion of one's natural Archetypes) can be harmful and even poisonous to one's inner Nature. While the danger may be abrogated when working at levels beyond the Archetypes, the danger does exist when working at the Archetypal level. Not only can working with alien Archetypes harm one spiritually, doing so can prevent the individual from accessing his or her true keys to the mysteries. For these reasons, it is usually best to work with the Archetypes of one's known Ancestors and with those to which one has a clear spiritual predilection as opposed to working with Archetypes not clearly native to one's own spiritual construction. 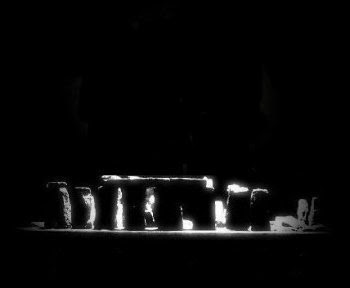 Given the metaphysical reality of soul-friends as discussed in my previous entry (Anam Chara - Reyah - Soul Friend), it becomes clear that each of us, in our search for a coven or other esoteric group in which to belong, the concept of soul friend bonding is very important and consequential to successful shamanic magical mystical work. Necessarily then, to be 'rejected' from core membership into any particular coven or esoteric group should be understood through this concept. Each of us needs to find our true place, the unique coven or esoteric group which will support Divine consciousness among the collective blend of soul friends. Finding our true soul friends takes time, commitment to pathwalking, exploration, iterative self-evaluation and patience. Likely, we will be rejected and we will reject others many times upon this quest. These rejections are not value judgments, but steps upon the way toward finding our true group of soul friends. I give thanks for the those times I have been rejected, for they have sped my way toward finding my soul friends as opposed to being held back by remaining where they are not. We can learn from many people, but few are those who are greatly blessed to learn among soul friends in the metaphysical sense, made of the same 'soul-stuff', as described by the terms anam chara and reyah. In follow-up to an April entry (Reyah - A Friend Like Me), I've discovered the Celtic term which describes the concept of soul-friend (as does the Hebrew term, רֵעַ reyah). The Celtic term is anam chara. Anam Chara is a Gaelic word meaning soul-friend. Anam - soul, Chara- friend. The concept derives from an ancient Celtic tradition and is still a popular practice in many spiritual traditions in Ireland today. The anam chara acted as mentor, teacher, companion and spiritual guide. The emphasis was on spiritual companionship and direction as opposed to today's romantic notion of the 'soul-mate'. The relationship was much deeper and often lasted a lifetime. The Celts believed the anam chara was joined in an ancient and eternal bond with his/her friend of the soul and this bond could not be broken, even if the friend moved away and there was a great physical distance between them. The Celtic understanding did not set limits of time and space on the soul nor was there any split between the sacred and the mundane. All aspects of life were manifestations of soul. Many ancient Celtic philosophies or perspectives passed into the Irish Christian Celtic tradition and in spite of many attempts in the past to 'Romanize' Irish Christianity, these remnants remain. There has been a surge in interest and an urge to reclaim the wisdom of our Celtic spirituality. However, the danger lies in approaching the tradition as another fashionable and exotic spiritual programme. The anam chara reminds us that spirituality or soul work demands commitment and the willingness to embrace the light and the darkness of our life's journey and allow it to be. In Jewish Kabbalah, one's anam chara is called a reyah. King David had a reyah, an anam chara - Jonathan. Edain McCoy discusses the ancient Celtic concept of the anam chara (soul friend bonding) as it exists within the context of shamanic traditional Celtic Witchcraft in her book, Celtic Women's Spirituality: Accessing the Cauldron of Life.